With Christmas well on its way, its the time of year when parents across the country are in search of fun and inexpensive gifts to pop inside their children's stockings on Christmas eve. Along with the usual offerings - toothbrushes, candy canes, maybe the odd pot of slime if you're feeling particularly adventurous! - most of us end up at a bit of a loss for toys small enough to fit inside a stocking whilst still being fun for the children. But there's one such "toy" that should be avoided. Laser pointers (also known as laser pens) tend to be very popular with children - I remember having one myself as a child, and as they are cheap and readily available - many parents may see them as a good gift, without being aware of the potential danger they pose. 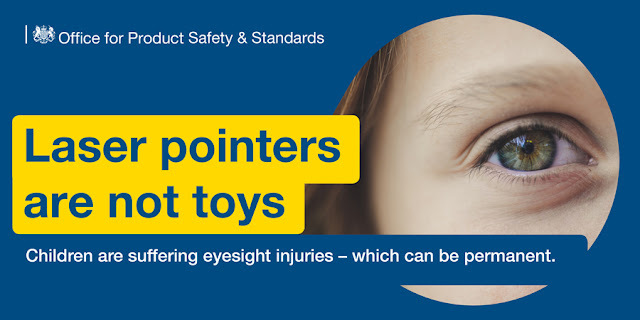 The Royal Society for the Prevention Of Accidents are leading a campaign to make parents aware of the potential dangers of laser pointers this Christmas. Their website states "Tests show that many laser pointers may be 40-80 times more powerful than the label implies" and due to technological advances, their power is increasing all the time. Laser pointers have the potential to cause serious and irreparable damage to the retina, as well as permanent loss of vision. Infact even a brief glance at a laser pointer can be enough to cause irreversible damage to the eyes. Research by Fahd Quhill, Consultant Ophthalmologist at Royal Hallamshire Hospital, has shown that 54 ophthalmologists have treated at least one patient with eye damage caused by laser pointers, and the majority of these were children under 10 years old. Infact Mr Quhill himself began his research after treating a young child who had been left with the vision of a 60 year old following the mis-use of a laser pointer. The potential damage done by laser pointers isn't limited just to your child's own eyes either, there have also been cases of high power lasers being shone into the eyes of car and train drivers, and even pilots. Such crimes are now an offence under a new act, and are punishable with fines of up to £2,500 or up to 5 years imprisonment. Don't hold a laser beam on the skin, as strong laser pointers can cause skin burns. To find out more about the potential damage of laser pointers, please click HERE.